Concrete Connexion is the award winning, premier concrete studio and workshop in the Washington, DC area. We provide start-to-finish services for every job, from the smallest and most intimate bath to the largest and most welcoming kitchen. We work with designers, architects, and homeowners to provide enduring and elegant living spaces, with an emphasis on unique concrete elements. Concrete elements for your home, garden or business are hand made products from our studio, each one uniquely made for your project. 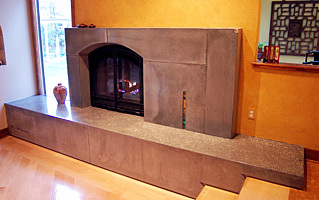 The medium of concrete is extraordinarily versatile, with sculptural qualities far beyond those of most other materials. We are constantly finding new ways to use this tactile, fantastic medium to capture the beauty of stone, the precision of inlay work, and the rich texture of wood. © 2008 Jarman Company, Inc. | All Rights Reserved.